Welcome to my homepage with lots of vegetable recipes to cook and enjoy, but first I want to introduce some facts behind, what made me conscious of what I was feeding my body to change from an omnivorous to a vegetarian in 2014. With the pollution of the sea and animals being fed with chemicals, for the health conscious person, vegetable meals are the best and safest way to eat. In 2010, the oil spill in the Gulf of Mexico caused a catastrophe. COREXIT dumped thousands of gallons of oil dispersants into the sea to control the oil sleek. Studies showed the oil dispersant is toxic to marine life. Thousands of fish have been washed up dead on shores, all around the world. Dangers of consuming vegetable oil, vegetable shortening, and margarine. These are made with hydrogenated oils and detrimental to our health because of the chemicals used to process trans fats. The human body does not recognise vegetable oils and margarine because they are made with chemicals and gasoline. Eventually, consuming vegetable oils and margarine over a long period, block cell receptors and can lead to the epidemic of cancer, diabetes type 2, heart disease, breast cancer, prostate cancer, birth defects, autoimmune disease, asthma, and allergies. In this video below, Kevin Galalae on YouTube states that vegetable oil and margarine are depopulation food to shorten our lifespan and controlling the population levels. Trans fats are used in Cereals such as cornflakes, biscuits, cakes and processed food. These are fake food products, with little nutritional value, sold in packets and boxes decorated nicely to give a false belief that these are healthy foods. There are lots of videos on youtube, that demonstrate how to make your own natural oils and fats such as beef and lamb tallow, cold press sunflower seed oil etc. Dangers of fluoride in tap water which is an industrial waste. Fluoride lowers the IQ in children because of its toxicity. Mike Adams said that “Any food item can contain toxic fluoride, for example milk, fruit juice, mustard, tomato ketchup, and cereals. Avoid consuming trans fat. This video suggests 5 best oils to use. The Dangers of high fructose corn syrup has been changed from HFCS to just Fructose. The body can not digest HFCS, because the way it is made with the injection of enzymes and chemicals to change its molecular structure. The liver turns HFCS into fat when digested because it is not a natural product, and is contaminated with mercury as quoted by the Alex Jones Channel on 23rd October 2017 and may be linked to the genetically modified organism (GMO) in corn. Origins is an enlightening film explaining the origins of food and how the present day fake food is making people ill causing inflammation by eating food that contains preservatives, and chemical flavouring that is not grown naturally in the environment. http://www.well.org produced Origins for people to watch for free on the link below. Do we have to eat meat to get protein? All protein is made by plants. Every protein molecule has nitrogen and hydrogen. NH2 is the amino in the molecule. Amino is the composition to make a protein molecule. Below is a video explaining the toxicity of table salt and how it is destroying our cells slowly. Land mined salt such as the Himalayan variety are much safer to consume in my opinion. Table Salt vs Himalayan Salt – Table salt is a burden on the human body. Himalayan Salt is highly recommended for health. Can use in dieting, in the salt water flush. The sorry situation of even our meat is being treated with carbon monoxide gas to look fresher than what it is. Meat treated with carbon monoxide gas can look fresh for several weeks although the meat is decomposing and spoilt. The dangers of eating food containing (MSG) Monosodium Glutamate, also labeled (E621) on some food labels. The following news video states The flavour enhancer MSG (E621) is used in many savory foods. There is a good chance you are consuming MSG. 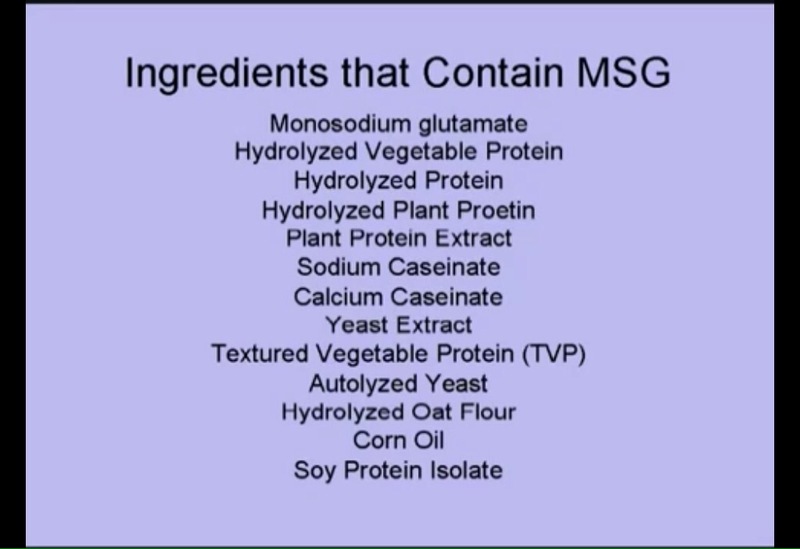 Independent research confirms MSG is NOT safe. MSG can cause obesity, diabetes, heart attacks, migraines, brain damage, epilepsy, diarrhea, joint pain, depression, dizziness, slurred speech, ADHD, insomnia, anxiety, etc. MSG is a silent killer worse than alcohol, drugs, and nicotine. Monosodium Glutamate is in 1000’s of processed foods, often under hidden names such as Hydrolysed Vegetable Protein, Hydrolysed Protein, Hydrolysed Plant Protein, Plant Protein Extract, Sodium Caseinate, Yeast Extract, Textured Vegetable Protein (TVP), Autolysed Yeast, Hydrolysed Oat Flour, Corn Oil, and Soy Protein Isolate. Teeth soaked in phosphoric acid for several days, dissolved enamel in teeth. Phosphoric acid is used as a battery acid. Ten companies who control the food industry. RECIPES BELOW – CLICK ON PICTURES.